I just discovered Maciej Drwiega‘s flickr gallery today and was really impressed by both the models and photography. 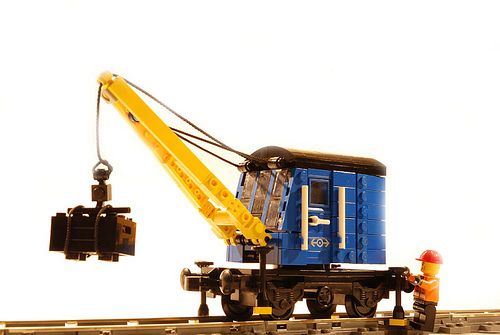 This railroad support crane struck as particularly nice due to its use of studes out tiles, plates and wings to create a visually interesting monochrome surface. The windscreen is also particularly nice. Oh my, that post title wins the “Most Gratuitous Firefly Reference in a Non-Science-Fiction Settng” award. Congrats! I couldn’t think of any relavent song lyrics/titles and that was the only pop culture reference to ‘blue’ I could think of that didn’t involve depression. Wow – nice find, Tim! I love it when awesome new builders come out of nowhere.